Unearth is a game by Jason Harner and Matthew Ransom, published by Brotherwise Games. It is for 2-4 players. In this game, players take on the role of leader of a small tribe of Delvers. They will be trying to reclaim lost Ruins and gather Stones so that they can build amazing Wonders. In the end, the player that can collect the most points will be declared the winner and will return their tribe to it's former glory. To begin, all of the Stones tiles should be placed into the bag. The Delver deck is shuffled and each player is dealt 2 cards. The deck is then placed in the middle of the play area face down. The Ruins deck is shuffled next. Each player is then dealt 1 card face down. The top 5 cards of the Ruin deck are removed from the game and placed back into the box. The End of Age deck is shuffled. One card is randomly selected from the deck and placed on the bottom of the Ruins deck. The remaining End of Age cards are returned to the box. The top 5 cards from the Ruin deck are placed face up in a row in the middle of the play area. The deck is placed face down at the end of the row. Stones are randomly drawn from the bag and placed on each Ruin, equal to the number on the bottom of each card. The Named Wonders deck is shuffled and a number of cards are drawn from it equal to the number of players plus 2. These are placed in a row with their corresponding tokens on top of them. The remaining cards and tokens are returned to the box. The Lesser Wonder and Greater Wonder tokens are shuffled and placed face down on top of their corresponding card. Players choose a color and receive a corresponding set of colored dice. The first player is chosen and play now begins. The game is played with each player taking a turn consisting of 2 phases. Those phases are the Delver phase and the Excavation phase. The first phase is the Delver phase. This phase is optional. In this phase, the player is allowed to play as many Delver cards from their hand as they would like. Each card is resolved immediately and in the order they were played. They are then discarded. The second phase is the Excavation phase. In this phase, the player must roll one of the dice in their pool and place it on a Ruins card. It should be noted that the player must declare which die they will roll and which Ruin they will be rolling for, before they actually roll the die. After the die has been rolled and placed on the card, the player should then check to see if any Claims have been resolved. This also happens if a die is rerolled or a card is played as well. Resolving a Claim means that the player checks to see if the total of all the dice on a Ruins card is equal to or greater than it's claim value. If it is, then the Ruin is claimed by the player with the highest individual die result on the card. They will then place the Ruins card face up in front of them. Any players that had dice on the card and did not claim the Ruin will then draw cards from the Delver deck equal to the number of dice that they had on the Ruin. The dice are then returned to their respective owners. Any Stones remaining on the card are returned to the bag. A new card is then drawn from the Ruins deck and placed face up in the empty spot. Stones are drawn from the bag equal to the value on the bottom of the card and placed on it. It should also be noted that when a player rolls a 1, 2 or 3 during either this phase or during the Delver phase, they immediately take a Stone of their choice from the Ruin that they were rolling for. The Stone is then added to their tableau in front of them. If there are no Stones on the Ruin, then the player randomly draws one from the bag. These Stones must be connected together in hexagonal rings with an empty space in the middle. This is how Wonders are built. If the Stones in the ring are all the same color, then the player will fill the empty space with a random Greater Wonder token. The token is placed with the point value face down. If the ring contains more than one color of Stones, then the space is filled with a random Lesser Wonder. Named Wonders require a specific selection of Stones for them to be built. The player must meet these requirement to be allowed to add this Wonder to their tableau. The player that builds one of these will add the matching card to their play area where it's effects are then activated. Stones may be arranged in any order that the player wishes, however once placed it may not be moved unless a card or game effect says otherwise. Once a player has completed their Excavation phase, play passes to the next player in turn order. The game continues with players taking turns until the End of Age card is revealed. If the card is a Ruin card, then Stones are placed on it like normal. If it is an Event, the instructions on the card are followed. The game continues until all the Ruins on the table have been claimed. When that happens, the game ends and scoring occurs. 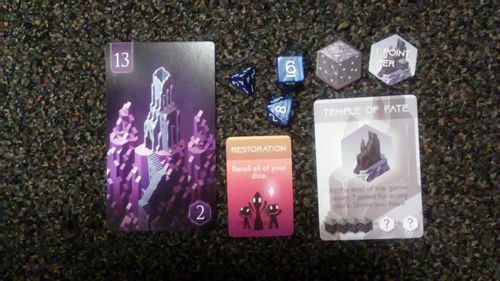 Players score points for having sets of of the same colored Ruin cards. They also earn points for having 1 of each of the 5 color of Ruin cards. They score points for Lesser, Greater and some Named Wonders, as well as for building 3 or more Wonders. Players add up all their points and the player with the most points is the winner. This game has a lot of great looking pieces. For starters, there are 4 sets of dice in 4 different colors. These have a marble like quality to them that looks great. There are 3 sizes of cards included in this game. There are the large tarot sized cards that are used for the Ruins and End of Age decks. The artwork on these is great. They have an amazing look that makes me think of Ryan Laukat's artistic style. Then there's the regular playing card size cards that are used for the Wonders and the Reference cards. The Wonders match up with the Wonder tokens. Once again, similar style artwork and great look. Those reference cards are especially helpful and are great to have. They have a turn order summary on one side and a scoring summary on the other. Finally there's the small euro size cards that are used for the Delver deck. These show off the little Delvers that represent your tribe. They kind of remind me of the characters from the Patapon video game. Of course there's more than just cards with the game. There's lots of thick cardboard tokens for the Lesser, Greater and Named Wonders, as well as the Stone tokens in 4 different colors. There's also a great looking cloth bag to hold all the Stone tokens in. Like I said, the game has some amazing looking pieces and the artistic style flows through each one. Each piece is really great quality and thematic. Overall, I love the art style and feel of the components. The rulebook for this game looks great. There are lots of pictures and examples throughout the book. It starts off by giving you a kind of history/overview of the game with references on where to find each aspect of the game with page numbers. The setup and phases of a player's turn are all laid out in great detail. There's even a special setup for playing with only 2 players. Most of the next pages are all about how the game works such as resolving claims, determining who wins in a tie and building Wonders. The last couple of pages contain a frequently asked questions section. It even goes back into more detail on explaining how the Named Wonders formulas on the cards work. Overall, the book does a great job explaining everything and looks good doing it. Many of the pictures are quite large and look great. Everything is easy to read through and understand. There was a typo or 2 that I noticed but nothing that will trip you up. I'm very pleased with the rules for this one. A definite job well done. I first discovered Brotherwise Games several years ago when my son and I were introduced to Boss Monster at a local International Tabletop Day event. He and I both loved that game and all the expansions for it and Boss Monster 2. Looking back on those games, I approached this one with the hope that it would be as much fun for us as those were. This one has a combination of dice placement and set collection mechanics, as well as a little bit of tableau building. I like how all these mechanics work together to make a really great game. It has plenty of strategy with figuring out which die to roll at which Ruin to place it on. Do you roll your 8 sided in order to try and take control of a Ruin or do you roll something smaller like the 4 sided which has a 75% chance that you'll get a Stone. That's what I like about this game. Unlike many other games, this one rewards you if you roll low. That ends up being quite good for me as dice usually hate me. Of course you'll also want to be building some Wonders. Trust me, your opponents will be rushing to try and make that happen as often as possible. Figuring out how to lay those Stones to best maximize their usefulness in creating Wonders is a must. Another thing to consider is when to play your Delver cards. These can be extremely helpful when used at the proper time. For me, this game just hits lots of things that I like. In regards to my earlier hopes, I have to say that while this game bears no similarities at all to Boss Monster, it's still very fun to play. It definitely exceeded my expectations. Fans of dice placement and set collection games should enjoy this one. I would definitely recommend it. Unearth is a dice placement game with aspects of set collection and tableau building thrown in for good measure. It's a fairly short game. Most games last around 30 minutes, making this a great filler game. The artwork for this game is really great. 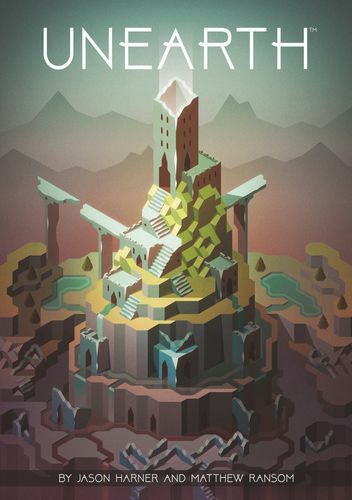 It makes me think of the art style of Ryan Laukat, designer of Above and Below and City of Iron. The components are great and are very good quality. I especially like all the card designs. The game isn't hard and can be easily taught, even to younger players making this a great family game. Even though it's simple to play, it still has plenty of decisions to be made which I think will appeal to even those strategy game fans. Fans of dice placement and set collection games should really enjoy this one. It's light and fun and one that I enjoy quite a bit. I would definitely recommend this game. Gather your Delvers and Unearth a winner.